The latest suite of multi touch software driving the Holo-Info-Desk kiosks and touch surfaces allows a wide range of applications. It is available in four versions, one of which is a free application including. Is the most advanced, complete, and competitively-priced multi-touch software application on the market. With four new applications, customers gain access to top-level multi-user software tools that are specifically designed for creating interactive touchscreen applications and deploying highly captivating multi-touch experiences within any public setting. Composer can be customized to fit a wide range of professional applications, including multiple game templates and configuration forms. When combined with Omnitapps-driven displays, organizations are able to direct traffic directly to their location while captivating audiences with highly interactive content. Composer Ultimate includes all of the functionality of Composer Advanced and in addition includes the latest Interactive Wayfinding application. Is a full featured multi-touch software package which includes 20 applications. Is a multi-touch software package with 18 applications and basic setting configuration. A standalone application available for purchase is focused in creating a paperless environment. This software application is totally focused on creating a paperless environment for viewing, sending and managing PDF brochures. With the Cloud Brochure Selector the location (retail, tradeshow, information centre, etc.) never runs out of brochures and are always up-to-date. Easy content management: in the configurator you select a folder for the content. The only thing you have to do is copy your files (photos, videos and PDF) to your selected folder. Take your step into the world of Multi Touch content interaction with our free offer. Click on the logo to request your free fully functional no time limit Composer Showcase application. Learn how to use the power of Multi Touch and Holodesk to Engage with customers like never before. ICE AV Director, Kevin Andreassend will be presenting at the North Harbour Business Expo with his seminar “Digital Touch Points – the Power of Multi Touch”. It will include a live demo of the HoloDesk system on how business owners can utilise the HoloDesk system to invigorate and take their customer engagement to a new level. Learn how to use the power of multi touch to revolutionise your marketing activities. By utilising existing content such as photos, brochures, web sites, videos, You Tube, Facebook and placing it into a multi touch environment, businesses are able to cut thru the clutter and distractions visitors face in expos by using the most natural of all senses know to man …… multi touch. By using a HoloDesk system exhibitors can easily capture the undivided attention of visitors instead of the “no thanks, just looking” syndrome. Location North Harbour Stadium, North Shore, Auckland. COST Absolutely FREE with NO COST parking. The seminar is part of the North Harbour Business Associations Business Expo featuring a number of North Shore businesses. 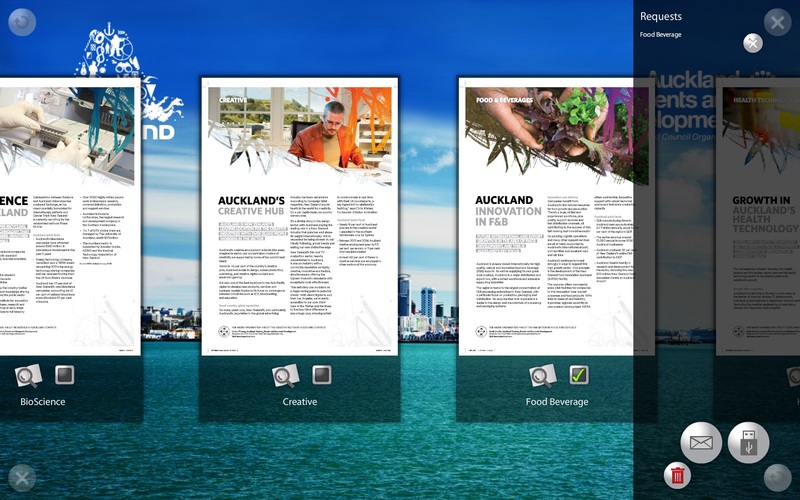 Multi-touch software brings all your brochures, video, web, graphics, maps alive at your touch. Exhibitors world-wide face significant challenges on how to recoup the cost to exhibit. Whether you are a small home based business, small manufacturer or a major force in the market every exhibitor faces similar challenges. Do you have these pressure points to cope with? – share relevant media that leave a strong impression. – establish positive connection with visitor for post show followup. It all starts with the moment a visitor approaches your stand and how you can achieve their attention and their time before they walk off. That crucial 60 seconds the visitor is thinking will I stay or try and get away to find something else more interesting. When the visitor finally walks off after spending time with you, you want them thinking “good they will follow-up and with me next week” and not thinking that they wasted 5-10 minutes with your sales pitch and that you are of little relevance to them. Part One Video using actual content for an expo. That is where multi-touch surfaces come into their own. Simply playing a video or PowerPoint on a screen on the wall in the hope that this is going to engage the visitor for 5 minutes is a fallacy. In this 2 part video we show you how web sites, photos, catalogues, presentations, videos, maps and hot spots can all be used to give you instance access to engage dynamically with visitors. Todays visitors wants to be entertained, go down a discovery and be wowed with what you have can show or demonstrate. The power of the multi-touch surface driven by a powerful software that uses your existing media is now a reality. We can not make you into a super sales person, fully coherent, engaging but we can give you a major tool that can put you ahead of your competitors that was once only affordable to the big guys. Contact us now to discover how multi-touch can work for you. Multi-Touch software delivers an engaging media experience for every commercial sector. We are excited to announce that the latest development in multi-touch off shelf software powering the Holo-Info-Desk is now available for shipping. The software is limited only to a designer or marketers imagination to create experiences users will enjoy and find informative. The suite of applications has become a power house of multi touch capability allowing a diverse range of industries to easily take their existing content and place it into a multi-touch environment. This ability is significant as it lowers the entry-level for companies to create compelling brand experiences with their media for customers. to enjoy and explore. Whether it is watching a Youtube video, browsing a web site, viewing graphics, playing a training video , searching a geographic map or hot spots within a photograph is also easily achievable on a Holo-Info-Desk touch environment using our latest software. The Holo-Info-Desk is a dynamic multi-touch system that includes a functional, multi dimensional and fully customisable software suite perfect for any industry and application. 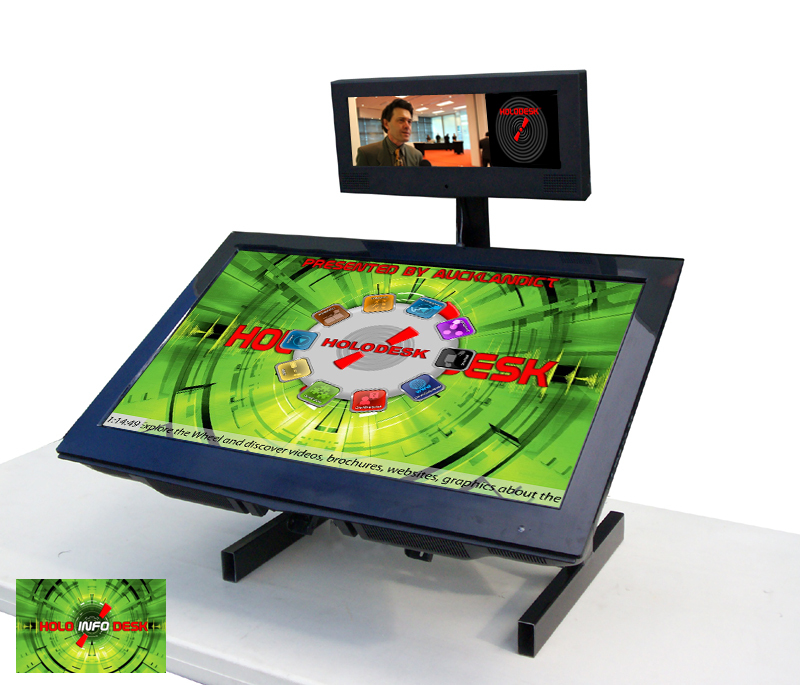 Perfect for large format interaction via HoloDesk Window, Table, Kiosk or Console. For customers who want to overcome the resistance often found at expos where the phrase “just looking” or “I’ll be right” is heard, the Holo-Info-Desk when used correctly, becomes a powerful sales tool to inform, engage and entertain and creating a buzz about your brand, media and the message you wish to share. Meanwhile throughout this experience you are able to engage with users and help them discover how your company can help them, solve their challenge and what is so special about your products and services. For customers wanting to experience how multi-touch large format screens can enhance their marketing efforts we would like to invite you to experience a hands on multi-touch experience. Multi touch content management in 2012 has already started with the exciting release of Version 2, the latest of the OmniTapp software powering the Holo-Info-Desk. Over the last 6 years multi-touch surfaces required significant budget and access to some high quality programmers to create that engaging experience. Now with the latest version of Omnitapps there are a range of excellent applications within the suite of multi-touch applications. In this video we have a short chat about some of the features available in Version 2. With Version Two it can now be used with Multi Touch and Single Touch hardware. The ability to utilise your existing media such as graphics, video, pdf, along with web sites, google maps all come to life allowing users to drill down for information and have a visual and touch experience. It is the 21st Century canvas that converges, watching, reading, interacting, exploration, manipulation, listening. Whether it is for a museum, retail shop, technology centre, office reception, street window, venue foyer the interactive surface converges the photo, video and brochure with the screen for user control. The Holo-Info-Desk is powered by the unique Omnitapps multi-touch application suite present your products and services. Allow users to interact with product photos, videos, brochures and even web sites within a multi-touch environment or create unique gaming experiences based around your product or services. 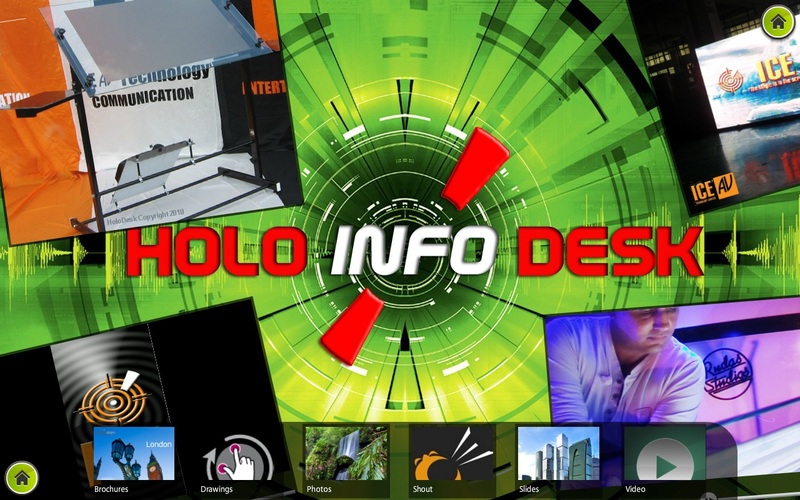 Holo-Info-Desk is the large format surface that delivers the very latest experience allowing users to interact with all manner of content and media. Present websites, YouTube videos, PDF files, images and videos within a multitouch environment. The MediaWall makes it possible to present selected files and websites to multiple users in a multi-user touch environment. Through multi-touch, users can simultaneously view different files, browse through websites, view Google Maps and (YouTube) Videos. The media can be scaled and rotated through multi-touch gestures. Besides viewing it is also possible to draw and make notes directly on the media. MediaWall is the ultimate multitouch presentation tool! Give your touchscreen an iPad look with the photo Slider function. The Slider presents images using a slider. By swiping left or right the next picture comes in. Naturally, you can select the pictures yourself. Swipe through images with just a flick of your finger in our infinite slider. With the Marker function you can add extra content to your images through markers. Add touchable markers with specific content to your images. Markers can contain multiple PDF, Video and image files. With the brochure Request function you no longer need paper leaflets. Request is completely focused on providing your visitors / customers with a simple tool to acces the information they are looking for. You do not need paper leaflets anymore. Visitors interested in brochures can view these on the screen and requests them directly. You can export the information entered at a later time from the database so you can handle all requests. Entertain your visitors and collect name and address information with the Puzzle game! With this multitouch puzzle you need to solve the puzzle as soon as possible. This is done by rotating and dragging the various puzzle pieces. The puzzle image is configurable by the user. Participants must enter their name and address information before they can try to beat the highest score. Form, to collect personal data. Entertain and inform with the Quiz! The OmniQuiz informs and entertains your participants in a unique way. The participant must answer a number of multiple choice questions as fast as possible. The answer to the questions can be found by examining a photo. The photo needs to be scaled and rotated by multi-touch gestures to find the correct answer. Challenge your visitors with this interactive shuffle game. Shuffleboard, the board game in which stones are pushed towards the goals, if they arrive you get the number of points that belongs to that goal. The total points are the final score. Play with two players at once an exciting game of shuffleboard. Determine the look of the stones and shuffleboard. Obviously, the scores are recorded and name / address in order to collect data. Highscore, here the top 10 scores are shown. Welcome your visitors with the Splash Welcome Page. Welcome your visitors with their company logo and visitor names. After touching the screen the main application menu is shown. Match is a competitive multiplayer game for your multitouch screen. With Match you need to match the correct images to the correct categories. The game can be played with 2 to 5 participants. The categories and the photos are fully customizable and can be used for expos for example to engage with customers where they need to match photos with product or service categories. A game that can be played by multiple people at the same time. This is a user-friendly touch screen interface and allow users to easily choose which video they want to start. The application is completely configurable. So you decide which videos will be shown. Gallery with videos, thumbnails of videos are displayed horizontaly. You can touch a video to select. Present your location-based content through the Map application and allows you to place markers on a Google Map and link your own information to the markers. Google Map, Google Map satellite or map view, zoom through multitouch gestures. Place your markers, mark your locations with markers Show marker related content, link content to your markers, photos, video and PDF. Browse through your PDFs, go from page to page by sliding, using multitouch zoom. Assign a QRcode to your markers, generate a QR code for each marker based on your site. The single website browser for your Touchscreen. With the TouchBrowser you can easily browse the internet. Comes with an onscreen keyboard. The Administration back end is easily accessible allows you to easily and quickly configure all the applications as desired. The Configurator makes it easy to manage all applications from one central location. You set your media files to show, the background images, data fields, etc. In short, you control it all from one simple application. Settings, in the configurator enable every application to be customized.